Finally, there is the topic of detection of planets of other stars. It may well become one of the most important topics, and in the near future at that. In 1978, the International Astronomical Union Colloquium No. 52 was held in Tuscon. But what appeared to be another colloquium documented in another proceedings book was something different. Despite their many common questions, the two fields of star formation and solar system formation were more and more diverging. Tom Gehrels felt that a new bridge was needed and argued that to explore frontiers, it is instructive to see the difference in methods and results of various authors. Hence, he suggested to compile a book covering all aspects of the two fields aiding to detect common areas, and to be used as a reference volume as well as a textbook. With this strong emphasis on the proceeding book, the conference was mainly held as a chance for the authors to meet and to adjust their views. To obtain full coverage of the fields and to strengthen communication, each of the 39 chapters was written by several authors, and sometimes using the drastic "shotgun wedding" approach. Further findings were published in a feature issue of The moon and the planets. Despite early skepticism, this concept turned out to be one the pillars of success. The book was used as a source for ideas and inspiration, showing the status and limits of the scientific progress in one of the most fascinating questions in astrophysics, that is the origin of our own solar system and of other star-planet systems in the universe. Gehrels suggested already in the first book to produce an updated volume and to hold another meeting in 1984. And indeed the PPII book was published in this year, with chapters revealing different schools of thought. Much hope was put into the upcoming observatories like the Hubble Space Telescope to converge these into a single view. It was also in this book where the second pillar of success of the Protostars and Planets series appeared as a bridge between the fields of planetary science and star formation. Back in 1978 not more than common believe as expressed in the starting citation above, the search for other planetary systems, although not yet feasible, was a clearly expressed goal of the upcoming science. A comprehensive statistical survey of nearby stars was an ultimate test for all solar planet formation scenarios and strongly influenced by the star formation process. Attempts to understand the mechanisms of planet formation appeal to several deep human motivations: to understand ourselves in relation to the universe of which we are part of, and to grasp the possibilities that the universe offers for planets and life elsewhere. 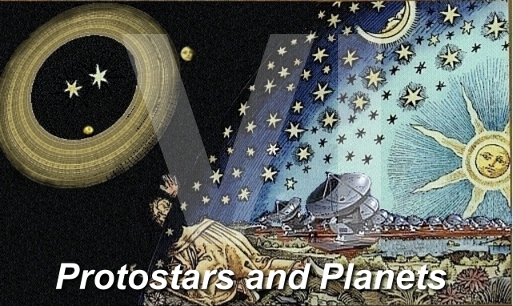 Nine years later the world of protostars and planets looked very different again. The third book of the series was busy with summarizing all the many advances being made in the different fields: The exploration of the solar system by spacecraft, the high-resolution images at different wavelengths revealing disk-shaped assemblages of dust and gas in nearby star-formation regions as the precursors of planetary systems, the new insights in very low and high mass star formation, the wealth of chemical information about solar planets, comets, moons, meteorites, but also interstellar clouds, as well as multi-dimensional (magneto-) hydrodynamical computer codes and models for disk, clouds, and giant-planet interiors. Yet, although the first confirmed detection of an exoplanet was already made at the publication date in 1993 (several terrestrial-mass planets orbiting a pulsar), it took a few more years to find the first exoplanet around a main-sequence star. A full chapter on exoplanets was the result of intensive research in the following PPIV book. The again lively PP conference held this time at the University of California, Santa Barbara, in July 1998 saw over 500 scientists from 27 countries. Further chapters dealt with brown dwarfs, Edgeworth-Kuiper Belt objects, and high-resolution optical NIR images of protoplanetary disks. ISO, the refurbished Hubble ST, and the 10m Keck telescope data were available, and PPIV research papers appeared in a special issue of Icarus. Many people thought that a conference of this size and the vast content of the PPIV book are the limit of what is feasible and constructive. In 2005, the 805 PPV participants from 31 countries had a different impression when arriving at Hawaii, Big Island. In dense sessions, scientists reported on a gain factor of 10 in planet detections, on the use of X-ray studies in star formation research, the increasing of multiple system studies, the intense exploration of the Kuiper belt, on the planet migration problem, and a precise aging of the solar system by dating meteorites and many more aspects of the science progress. PPVI is planned for 2013, and it seems again that we will hear reports about substantial progress in understanding the formation of our home system as well as other exciting worlds.